With their dazzling lights and rainbow-pure colors, lasers provide a fascinating breed between fireworks and theatrical lighting. Using these beams, we can entertain as well as communicate in an exciting and eye-catching fashion. Laser beams have fast become a common technique for adding glamor to events and stunning displays at corporate shows. Our highly experienced technicians provide the best full-color laser lights for concert tours, nightclubs, and corporate conventions among other occasions. The laser beam displays that we provide for events are customized for events and tours. 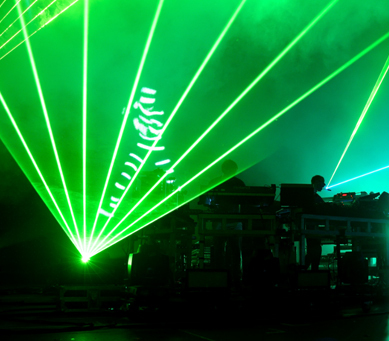 No matter the kind of party that you have, we can integrate our lasers into your performance to give it life. Our rainbow lights are beautiful, and we alternate them accordingly to provide beams and graphic illuminations to provoke emotions from the audience. Whether you are hosting an afterparty, showcasing a new product or preparing for a performance, our RGB lasers might just be what you need to make your event complete. We use lasers in creative ways depending on the type of event that we are handling. The broadest categories of laser beam displays are graphic illuminations on a surface and seeing beams in mid-air. Laser graphics or graphical illuminations can be used to tell a story or entertain the audience. These lights create outlines of products without any additional details or interior fill. Although this incapability is a limitation, laser graphics always get more attention compared to other visual effects. Our laser package is a culmination of the most brilliant and purest colors set and are tuned by our technicians to provide great timing and precision. An innovative use of a laser can transform any small party or event from its ‘small’ status to the best celebration you have ever had. We are always on the forefront to organize fabulous lighting effects for your wedding decorations, graduation party or any other special occasion. You do not have to try anything on your own only to end up settling for other forms of lighting that will not give your event the desired awe. With just a single call, we bring along sophisticated laser machines that work perfectly in both indoor and outdoor events. Our specialists do not just embark on setting up lights; rather we always analyze the theme before we choose laser colors that will spark the desired emotions. We try our best to create brilliantly colored laser lights for a wide array of special effects. For product showcasing, we always allow projection of light of the right intensity to maintain accuracy. We project beams to create fantastic patterns and shapes in mid-air and even scan the audience to bring an emotional touch. Our technicians understand the effects of beams in an outdoor event and always take precaution to ensure maximum safety. You can also get in touch with us for audio, screens and other forms of lighting.